How to find a word in another window and text file by a mouse click. 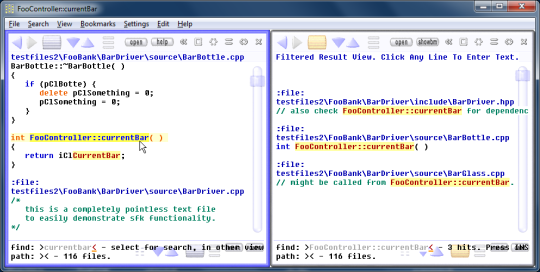 How to jump between many text files in multiple windows instantly in search for dependencies, with a Freeware tool for Windows and Linux/Mac. Activate the LEFT view (by left click into blank space). -  hold SHIFT and KEEP SHIFT PRESSED. -  RIGHT CLICK on the word. -  RELEASE the SHIFT key. but in the nearby view. "RIGHT click on a word SENDS it into a NEARBY view." -  RIGHT click on FooController and KEEP BUTTON PRESSED. -  move the mouse gently to the right, to currentBar. -  RELEASE the RIGHT mouse button. As you see, the full phrase "FooController::currentBar"
is searched within the nearby view. accidentially while marking the search phrase. then release SHIFT. This may feel a bit faster. And sometimes it isn't necessary to press SHIFT at all. "SHIFT+click is the safe way to search".